There are things in life we search out, things we stumble upon, and things we are led to. Often we don't realize until later (perhaps when we're writing a blog post) the circumstances that have brought us to the point we now are. It happens in life in a broad way but it also happens with small things. Three months ago I was starting to feel a bit panicked because my book was written and I was approaching step 2- market it. As lost as I felt writing the book, the thought of marketing it was worse. I'm simply not a salesman but I really believe in the message of this book. It's a book of inspiration and encouragement as well as an introduction to fabric and wire. So I really would like to get the word out- but how? I am no more a marketing maven then I am a techy guru. That was three months ago. Let me fill you in on what's come my way since. It started with a notice I saw for Kelly Rae Roberts' business e-course. It intrigued me and after reading her description I really felt like I should take this course. I'd never done an e-course but liked the idea and thought if nothing else it'd be good for me to see how they work. The class was fabulous. She filled all her posts with both information and encouragement. I keep that quote on a sticky note on my computer screen so I see it daily. It's such a positive reinforcement that the marketing we're doing of our art, or our writing, or our blogs is important and is how we show the world we believe in what we're doing. Since then one resource after another has come to me. 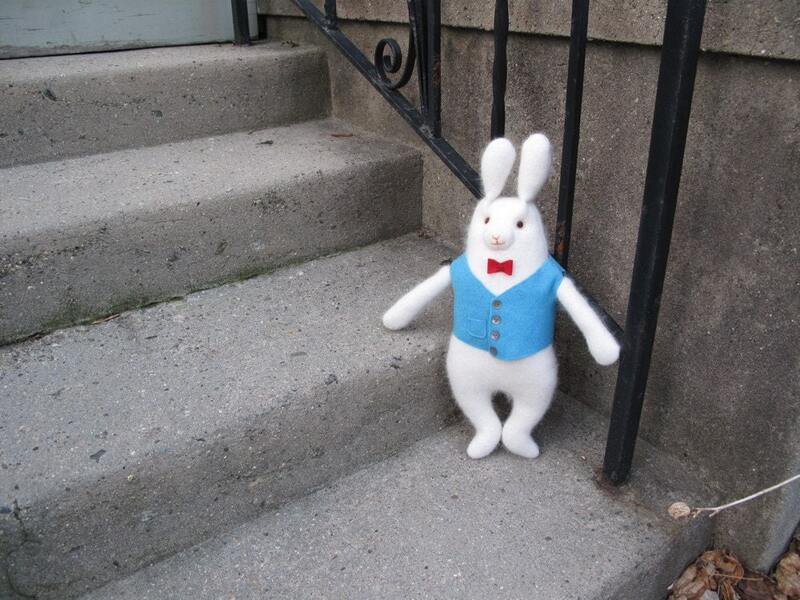 I was chasing my 5 year old through the stacks of our local library one day (thus the white rabbit analogy) when I stumbled into (literally) the marketing area. 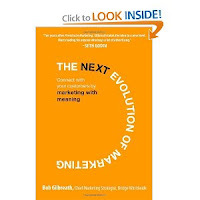 Down that rabbit hole I found the Idiot's Guide to Guerilla Marketing by Susan Drake and Colleen Wells and a book called, The Next Evolution of Marketing by Bob Gilbreath that is all about marketing with meaning. THEN I discovered Craftypod and Hello Craft, two podcasts that focus a lot of handmade/craft businesses. Several of the episodes have been great but just last night I was listening to Craftypod's Sister Diane interview Jennifer Perkins of the Naughty Secretary Club fame about how she was marketing her (then) upcoming book. You may call it the Universe but I feel like God's directing me to the resources I need to understand this next challenge. I'm positive He'll continue to lead me to the right situations and people so that I can get the word out. And when I'm feeling overwhelmed I re-read the Kelly Rae Roberts quote above and I remember that although hard, this too is important. So there's the story, and some of the resources I've run into. I KNOW that many of you are in the midst of this same learning experience or are approaching it so I'd like to encourage you to check out the books and podcasts for yourself. Then, if you have any resources you've found particularly helpful I'd love to hear them and I'm curious about how you feel about your marketing efforts. Is it easy?fun?challenging? I'd love to know! Jen - I don't have any resources to tell you about that you haven't already found on your own or through Kelly Rae's ecourse ... but I do want to tell you that you are going to do just fine marketing your book. Your work is beautiful & unique and I'm sure that your book will be wonderful. Please let us know when it is available so that we can buy it and write about it on our blogs too! Thank you so much for sharing this blog post. I was also touched by that quote from Kelly Rae's class. I am so excited for you and your book. And I am inspired by you and your book. I know I don't really know you, but through your blog and facebook I feel like I know you. And you make a dream like writing a artistic/crafty book sound doable. Thank you for that. I think you're doing great with your marketing. I'm enjoying your interviews and facebook, etc.. Keep it up!! What a journey you have had over the past few years! This book launch is simply yet another opportunity for you to crash through those fears (just as you did with your Etsy shop) and to fly to even greater heights. And its not as if you are progressing towards this moment unprepared either, given all that has come your way in recent weeks in terms of books, courses and resources. I'm sooo excited for you, Jen. Your creations are so beautifully unique and I have no doubt how popular your book will be. jen...i found you via dana.s blog interview of you. i am so excited to get your book. i took kelly rae.s online course as well. wasn.t she so generous with her information. i had the blessing of painting with her twice over the past year at different events and she is just as lovely in person. i love your blog and am a new follower and happy to learn we were "flying" friends all along. I would like to share a favourite quote of mine from the book "The Alchemist" by Paulo Coelho. We are all conspiring with you. Don't forget to make one of those buttons for your book so we can all put it on our blogs. Also, it looks like you are noticing the signs that the universe is giving you. Soon you will be on your way....marketing marketing marketing. Nothing to offer but encouragement. I think you are doing fine!